Of the three pieces submitted for The Anonymous Art Show 2013, this one came back… a little damaged. I fixed it and here it so I can share it with you…another small steps with big intentions! It was a happy little project and it made my heart smile. The other two paintings are part of the show. Hooray! 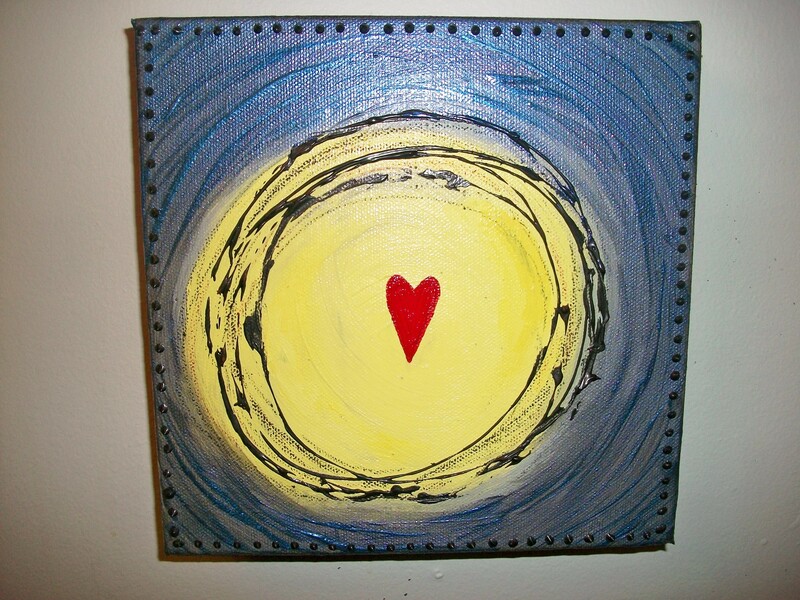 I titled it “Heart Meditation” because it pulls me into the core of who I am. Shinning, vibrant, pulsating with the breath of life. This is where the seeds of my intentions are planted and where I am reminded to be patient with myself, where I am reminded to be kind and loving. Some seeds need more time to grow; other seeds need more water, more sun, and more warmth. Others need to stay in the ground for a season or two. You may not see change with the naked eye (yet) but the heart knows. The seed has been planted. Let it grow. Let it go. This entry was posted in Creative Life, Transformation, Wisdom and tagged Anonymous Art Show 2013, dignard, engage from the heart, inspiration, Mixed media, nathalie, Nathalie Dignard, nathaliedignard, wisdom. Bookmark the permalink. ← Three Blank Canvases and an Anonymous Artshow!